Journaling will never go out of style. For some it may be a way to let off steam, while for others it may be a way to record their life's history. These leatherette journals are the perfect way to keep up your journaling and look awesome while doing so. This leatherette journal feels fantastic in your hands. At about 5.25" x 8.25", it's the perfect size to take on the go in a bag. The texture of the leatherette feels amazing, and since your design will be laser engraved, there's an extra textural quality. The journal has wide ruled paper in order to keep your handwriting nice and neat. It even has a ribbon book mark attached to keep your place. Have a blast designing the covers of your journal. Get it engraved single or double sided. Find a monogram, font, or graphic that suits you. If you have any special requests about design placement or anything else just give us a call. We are always happy to help. What's that you say? You love journaling so much you need another? Well you're in luck! 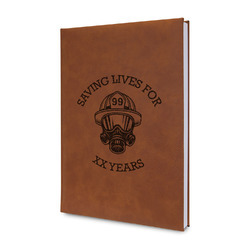 We have several different notebooks and journals to choose from! 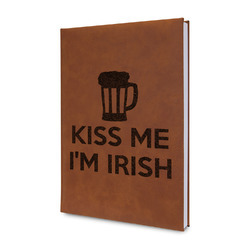 Check out our smooth hardbound journals, our softbound notebooks or our cute spiral notebooks. Definitely stop by the Office Section to see what else we have to offer.